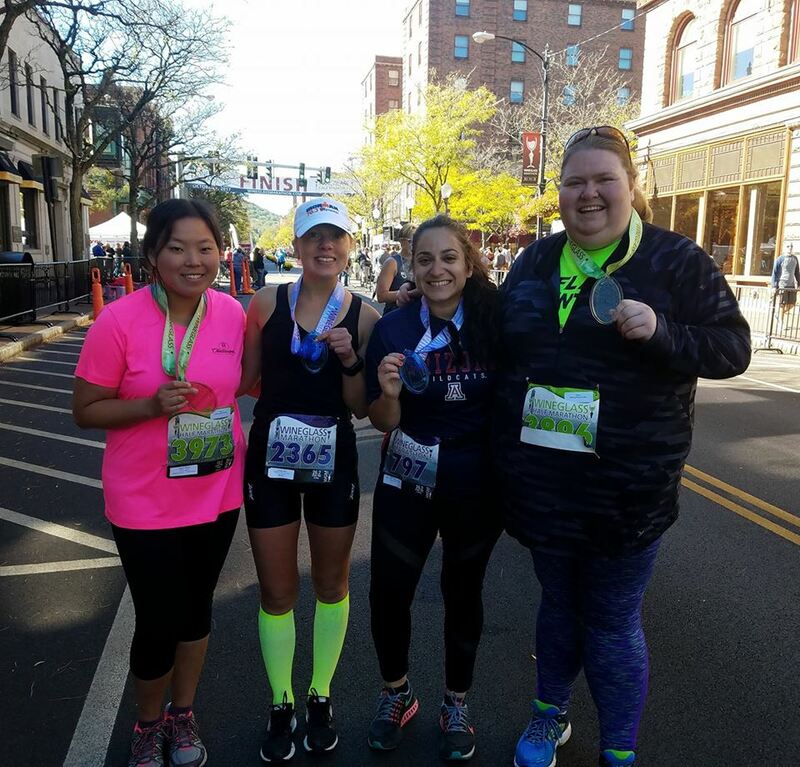 26 Lessons Learned From Running 26.2 Miles! At the beginning of 2017, I wrote a post with 12 Bucket List Items that I wanted to cross off in 2017 and one of those items was to run a full marathon. I set a very big goal of one day running 26.2 miles….and I did it! I crossed off this bucket list item back in October and IT WAS AMAZING. It took a lot of time and work to get here and I learned so much on my journey. 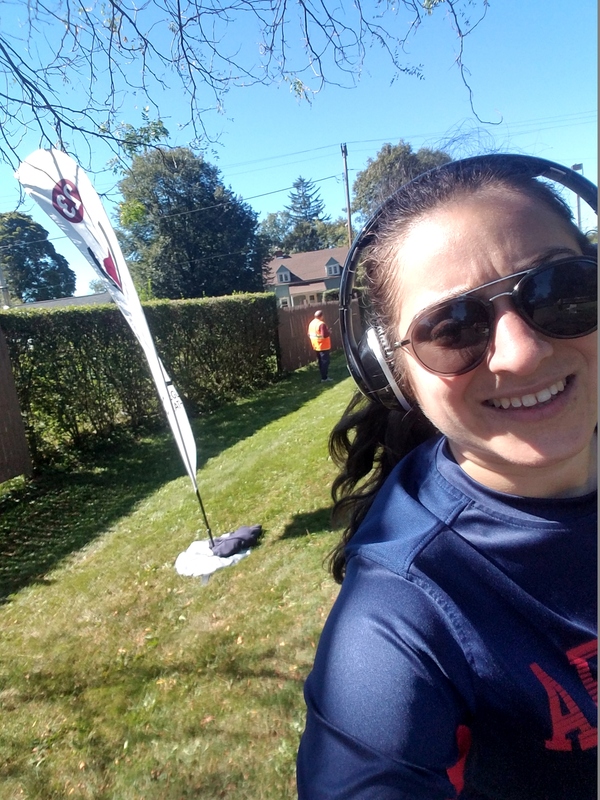 In just one week, I will be turning 26 so I figured now is the perfect time to talk about the time I ran 26.2 miles, took 26 selfies, and learned 26 important lessons. 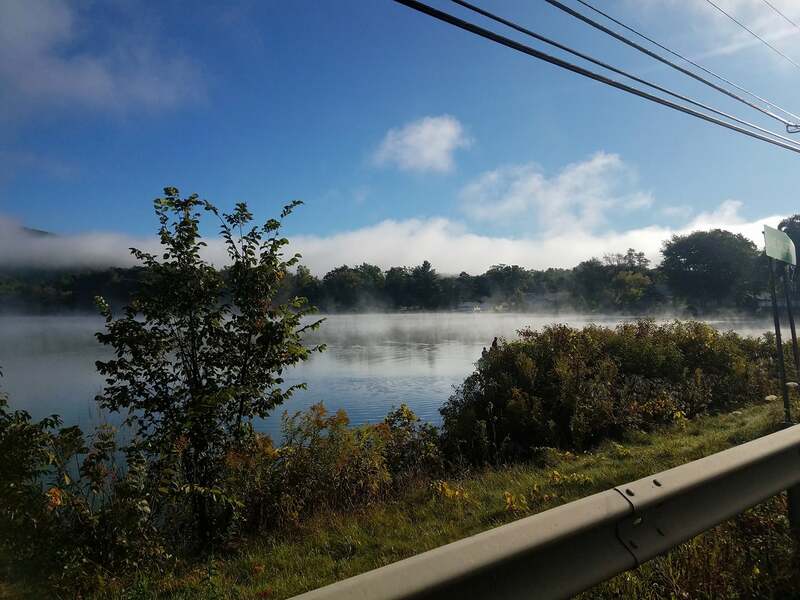 I decided to run the Wineglass Marathon in upstate New York because a friend invited me, the course looked beautiful, and I wanted to run somewhere with nice weather. I absolutely loved the race and during the race, I knew I wanted to document my experience so I took a selfie at every mile. Yes, 26 selfies…I know that’s a lot. Don’t worry, I’ll only share my two favorites, but I will definitely share all 26 lessons learned. I hope this inspires you to run a marathon because it really is life changing. Stay tuned for more running posts, because this website is Enthusiastic About Running! Enjoy the 26 lessons, my friends! #1: Apps are the best during training. Starting to train for a marathon was a bit overwhelming. Even just saying ‘I’m training for a marathon’ is a big thing. My favorite training app I used was the Nike running training app (not sponsored, wish it was lol). I loved the app because you could get your friends in on the fun, start competing, and there are also running plans to keep you on track! #2: Training is not negotiable. If you want to do a marathon, you absolutely have to train. It’s so important, not only because training will actually help you finish, but also because training affects how you feel after the race and how your recovery goes. Training also gives you the confidence that you will be able to finish because you’ve already put in those miles! You’ve already practiced, and now it’s just time for the real game! I would also recommend (in addition to your training), to make one of your longer runs an official race, just to get you even more excited! #3: Training requires more than just running. This was one lesson I didn’t really anticipate…because for every other race I’ve done, all I did to train was run. But a marathon is different. Training for this run requires more than running, you need to do some cross training, including HIIT (high intensity interval training) or yoga, to build up your strength. I actually lost over 25 pounds training for this marathon in a little less than 8 months because of all the strength training I was doing. I also started eating better because I noticed my running improved when I ate healthier. And losing weight, also made me faster, so it was a win-win-win situation! #4: You will learn what true discipline is. The discipline you gain from training for something this big, is easily transferrable across your life. True discipline is going to bed early so that you can do an early long run. It’s not eating that delicious pizza so that you can run that night and not have your stomach hurting. It’s not going out with your friends because you want to get a run in. It’s going for a run when you are exhausted and stressed. There’s a reason why people admire those who run marathons. There’s a lot you sacrifice to cross off this bucket list item, but the feeling of finishing is one of the most blissful feelings I’ve ever experienced in my life and I will do it again and again for the rest of my life. #5: Food and drink is a big part of running a marathon. First, you definitely have to carb-load before the race. You can learn all about carb-loading in one of my latest posts here where I describe what it is and even give you some recommendations of where to go if you are in the Phoenix area! One shocking thing I learned was that you get REALLY hungry while you run. I was already sort of aware of this from running my first half marathon but running a full marathon was a whole other ball game. In preparation, I made sure to stock up on energy chews and energy gels to have during the race. Make sure that you are staying fueled AND hydrated. I stopped at every mile and drank water/Gatorade making sure to alternate at each mile. Finally, you will be ravenous after the marathon and for the next few days you will always be hungry. The days following my race, I was eating so much and it’s common for people to gain weight, so just watch yourself. #6: The marathon you choose and the location of your marathon matter. #7: Taking care of your body is key. Before running a marathon, and while you’re training you need to understand that you will be putting 26.2 miles into your legs….think about this as if you were a car. Before you add a large amount of miles to your car, you need to make sure your tires will be able to handle it. Before running, make sure you think about any injuries you have and take some steps to take care of it. I have a knee problem so I made sure to train wearing a knee sleeve and it definitely helped me! #8: Working your way up to a marathon makes it seem more doable. I started running two years ago, and two years ago during my first 5k I walked most of it and almost threw up. After that 5K fail, I knew I wanted to improve because one day I wanted to run a marathon. So I signed up for another 5K, and then another 5k, and then a couple more, and then a 10K, then a 15K, and then a half. And each race brought me closer to my goal. During every mile of my marathon, I was able to remember how I felt when I ran that 5K, that 10K, that 15K, etc. and this gave me the confidence that I was ready for the full marathon. #9: Your race-day clothing is a big decision. Obviously you want to look good when you cross that finish line, and you want to look good during those action shots, but you also want to be comfortable! While researching ways to get ready for my marathon, I found out that chafing is a huge thing in marathons and if you wear new clothing, your body might freak out. So make sure you train in your race outfit a few times just to make sure you will be okay! 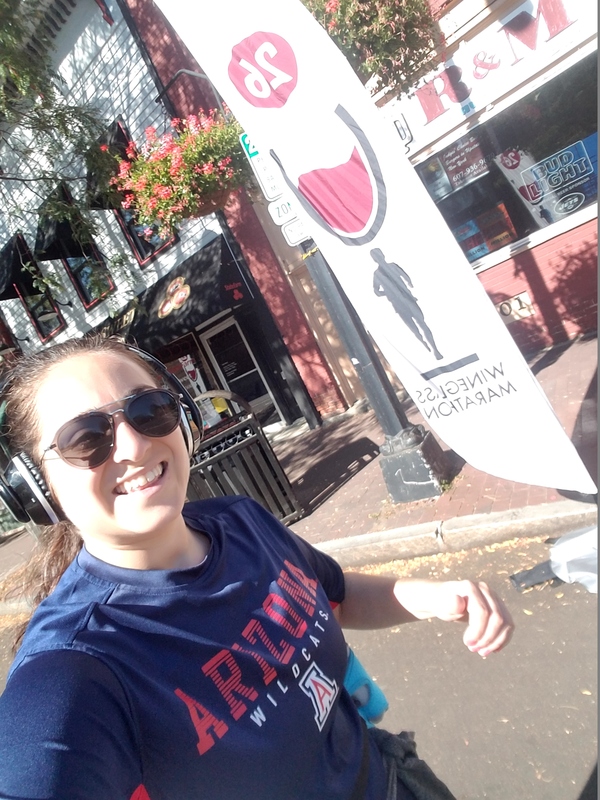 I wore a dry fit University of Arizona shirt and was so happy with it! #10: A good breakfast on race-day is important. Based on my internet research and advice from my running friends, I knew that a good breakfast before a marathon is so important. You need the energy to be able to run 26.2 miles, and as much as I wanted to inhale a huge breakfast I knew I needed carbs and protein so I had a bagel and a banana. I had to wake up at 4am because the internet told me I needed to eat 2-3 hours before my race. It was rough, but it was worth it and it worked out for me. #11: Pacers are a game changer. I’ve known about pacers since running the Hot Chocolate 15K (my favorite race!) last year. A pacer or a pacemaker, is a runner who runs the race at a steady pace. They have their pace on a sign and they carry it throughout the race so that you can ensure that you will finish at your goal time. For most races, I just run at my own pace but I knew my marathon would be tough so I decided I wanted to run with a pacer. I decided to run with a pacer to stay motivated (there’s usually a group of people running with each pacer) but also because I had a goal of what time I wanted to finish my marathon. It was so helpful to run with a pacer because as I ran, I talked to a few people, and I was able to keep a steady pace which didn’t tire me out as much. #12: You can run in headphones if you want to. Most races encourage you not to wear headphones while running because of the safety issues, and I completely agree that it’s important to be aware of your surroundings. But, at the same time, I enjoy listening to podcasts and music while I run. The reason I justify this, is because I run with people and I kind of stay in the middle of the pack. So my lesson learned is that it’s okay to run with headphones as long as you stay vigilant! #13: Wind burn is not a thing. 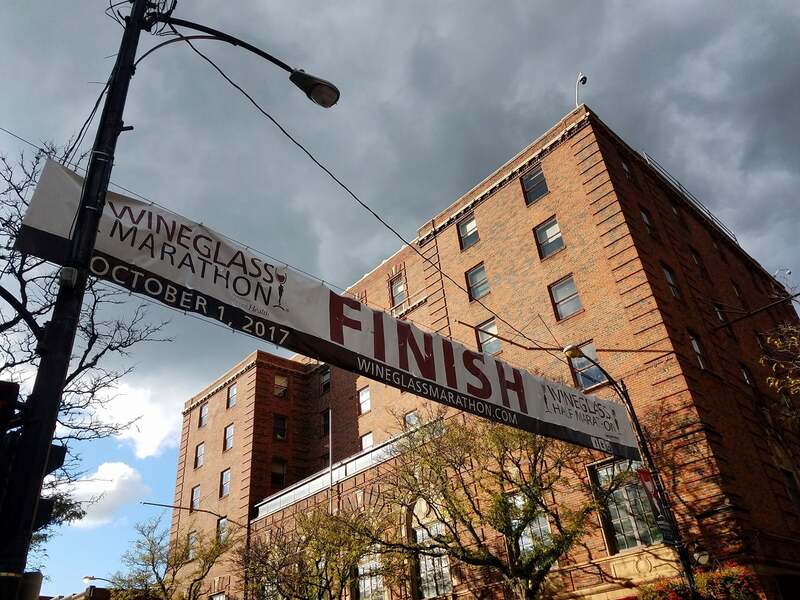 I ran the Wineglass Marathon in October in beautiful upstate New York so I wasn’t worried about heat or sunny skies so unfortunately I didn’t put any sunblock on (horrible mistake!). Running 26.2 miles outside without sunblock is not the greatest idea even if the sky is overcast. When I started complaining that my face was hurting, a friend told me that maybe I had wind burn, which meant the wind was so cold that it was hurting my face. I googled, and it’s not a thing, I was just sunburned. So make sure you protect your skin y’all! Running 26.2 miles is no easy feat. It’s a huge deal, and sometimes this can psych you out. I’m a big believer in mantras and positive affirmations (it’s the yogi in me) so of course I had my runner’s mantras ready. A mantra is a statement that you repeat to yourself over and over. One of my favorite mantras that I kept repeating to myself (at every mile) was ‘You are almost there’. Even at mile 13 (when I was halfway), I kept telling myself ‘you are almost there’ because it was what kept me going. This is one of my favorite mantras in general, not just for running, but for all parts of life. It really can be applied everywhere. ‘You are almost there’ is for someone who has set a goal and is on their way to reaching it. It’s for someone who is on a path to personal development and growth. It’s for someone who sees the light at the end of the tunnel, the pot of gold under the rainbow, the finish line sign. #15: You might lose your toenails. Thankfully I didn’t have to learn this lesson…but apparently you can lose your toe nails while running 26.2 miles. The reason this happens is because as you run you are constantly putting pressure on your toes (which start rubbing the front of your shoe)…and toenails fall off when you aren’t wearing the right shoes or socks. So just make sure you have the right shoes and that you’re not running weird. And make sure that the shoes you wear on race day, have been the shoes that you’ve run in at least few long runs to make sure they are comfortable! #16: Don’t be afraid to stop. During my marathon, the first 20 miles were scary easy….it wasn’t until mile 21 that I started feeling the miles. And I was afraid to stop, even to go to the bathroom. I was afraid I wouldn’t be able to get back up (lol) but I was fine! On a serious note, don’t be afraid to stop if your body needs you to stop. I ran 23 miles straight and walked mile 24 and 25 because I was worried about my knee. It’s all a matter of your goals for the race. I just wanted to finish, so I listened to my body, and stopped when I needed to. #17: Outside encouragement is amazing. I’ve done plenty of races and have had volunteers cheer me on and give me water, and I even had my own cheer squad when I ran my first half marathon (thanks brunch squad!) so I’ve known how amazing it feels to have people cheer you on as you run. 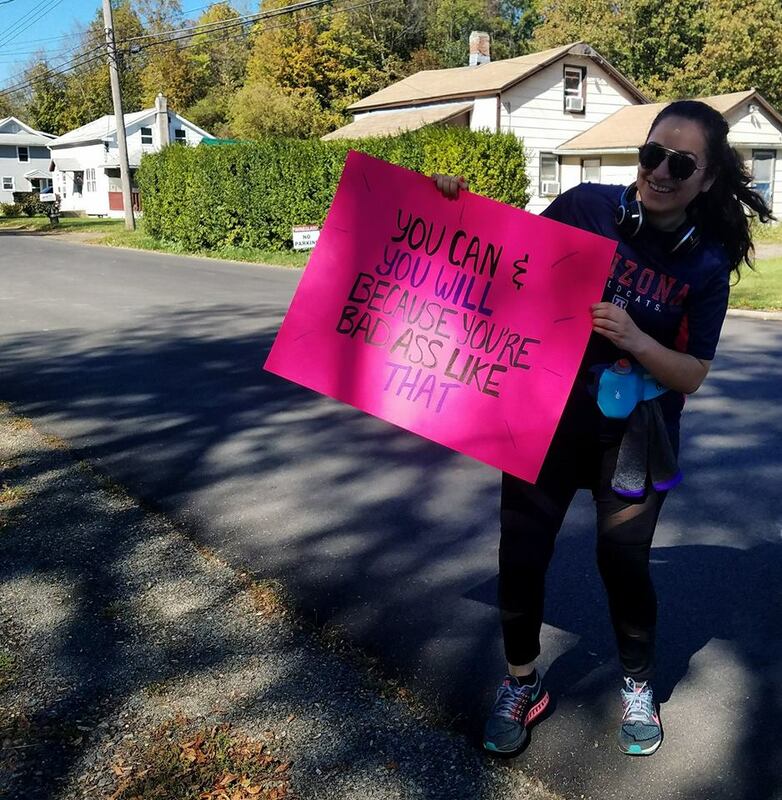 I don’t know if I can fully express how necessary it was for me to have that outside encouragement during my marathon. I of course encouraged myself with running mantras but sometimes you need a little extra push. 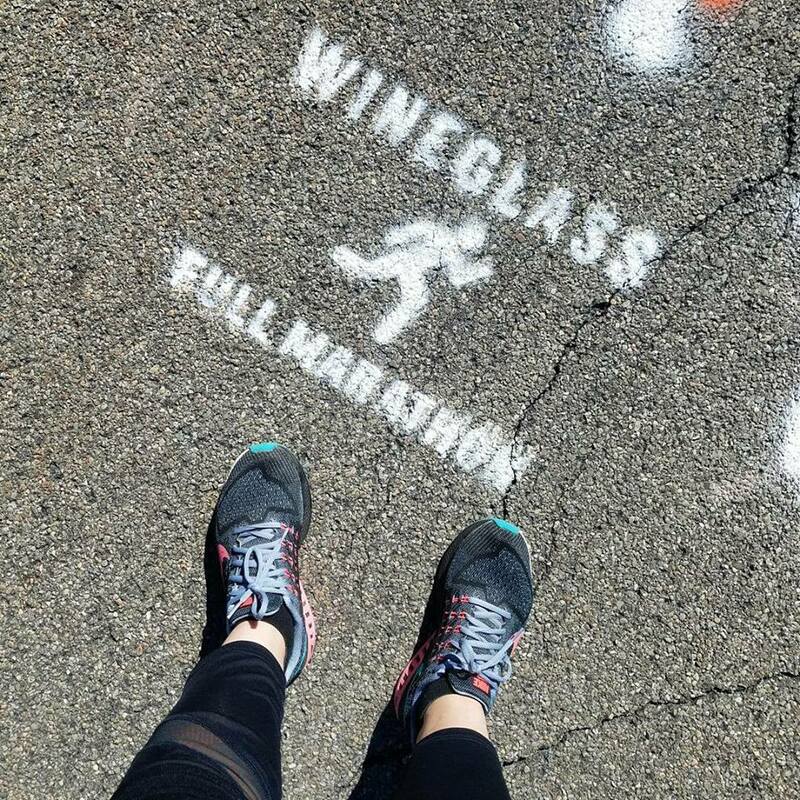 I loved the Wineglass Marathon because there were so many volunteers ranging from kids to elderly folks and they were all so supportive. From the volunteers giving water, telling us ‘you’ve got this’, to the people holding funny signs, to the people outside of their homes playing music, it was all so nice. #18: Runners are the sweetest kind of people. My running squad at the finish line! Everyone knows hikers are super friendly…well I’m here to tell you that runners are also super friendly and super sweet! Literally, every runner I met and talked to was so eager to share their experience. 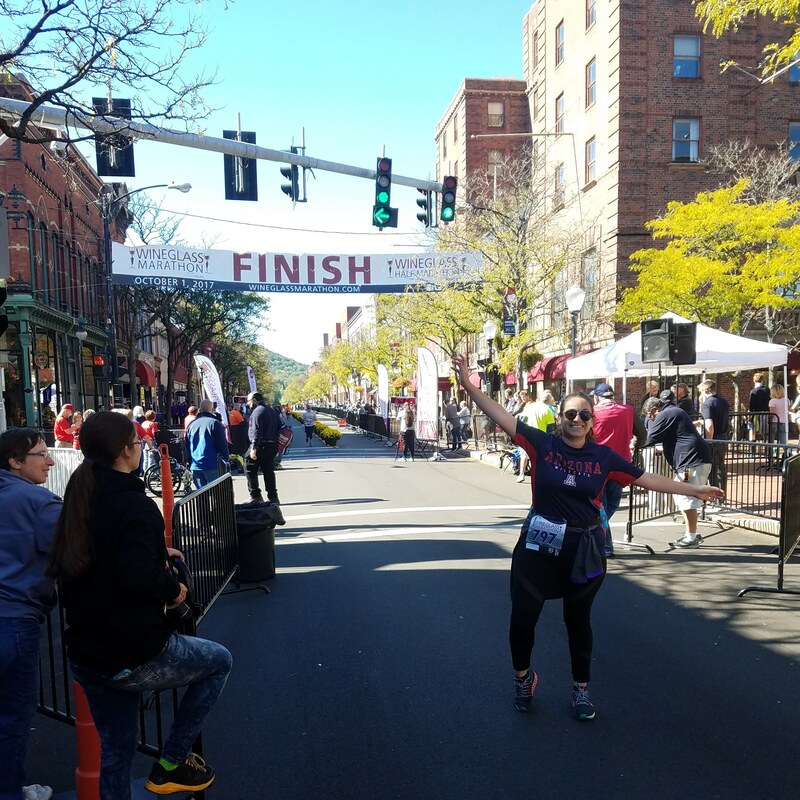 And everyone was also so interested in hearing my own story…and as I ran, every other runner high fived me and gave me words of encouragement. #19: Stretching during the race is acceptable. This was a lesson I learned during the marathon…when I was at mile 20, I noticed a few people stop and start stretching. I was tempted to stop and stretch because it looked like it was helping the runners, but I was afraid to stretch in case I pulled something. But I googled after, and learned this is totally acceptable! #20: Bio freeze is a life saver. If you’ve been following along for a while, you’ll know that I have a bad knee…you can read more about my injury here. But what that means, is that, when running long distances or hiking really strenuous trails, my knee starts to act up. During the race, there were medic tents and I kept seeing people getting sprayed with something…and at mile 19, I finally stopped and asked what it was and discovered bio freeze! Bio freeze is something used by runners to soothe minor muscle and joint pain. You either spray it on or you can use gel, and it gives you fast relief through cold therapy. It really is a life saver especially when you are almost near the end of the marathon. This is my favorite lesson learned. As I ran each mile, I did a mini celebration in my head. I smiled. I nodded my head. I told myself ‘you’re doing it, another mile’ because I knew how important it was to celebrate each mile. I celebrated because each mile is one step closer to your goal so make sure that you celebrate. You’re doing something huge, and you deserve to celebrate yourself. #22: Recovery is different for everyone. I learned that recovery is different for everyone. In my particular case…I did train (over-trained for a half marathon and slightly under-trained for the full marathon). You can blame my slight under-training to the Phoenix heat, but anyway I learned that you will be sore in places you never imagined! My lower back was so sore and I learned that one of the best things to do to help with recovery is to get a full body massage the very next day. #23: You will get emotional. Oh gosh my friends, this is one lesson I didn’t expect to learn. You will get so emotional as you run. I wanted to cry at the beginning, at the halfway point, and at the end. Knowing that you’re about to cross off a huge goal is just so overwhelming. I think I would have totally cried but I was a little embarrassed and also when I cry I breathe really heavily and I didn’t want to mess up my breathing as I ran lol. But I’m here to tell you that it’s totally normal to get emotional. Just as you get emotional when you graduate from high school, from college, while getting married, while having a baby, all of these big moments in your life…that’s what a marathon is like! I think the reason people get emotional is because yes you train and you know you’re somewhat ready, but we all have doubts right before we do something big in our lives….and finishing gets rid of all of those doubts and that is a very powerful feeling. #24: You will feel invincible when you cross that finish line. Feeling invincible after crossing the finish line! I don’t know if I will be able to fully express this but when you cross that finish line, you will feel invincible. You will feel like you can do anything in the world. You will feel like nothing can stop you, because my friend NOTHING CAN STOP YOU NOW. You will be so incredibly proud of your body, of your mind, and of what you just accomplished. It’s a tremendous feat and you did it! #25: You will love running even more when you finish. As cheesy as it sounds, after your marathon, you will love running even more. Even as you cross that finish line, and feel like your body is so tired, and like your body is running on empty, you will come to love running even more. You will come to love your body for what it’s capable of doing. You will appreciate the sport for what it is: a thing where physical, mental, and emotional abilities meet. #26: You will want to run even more marathons. I was seriously worried that I would run this marathon and that I would hate it and never want to run again. But, I had such an amazing experience that I cannot wait for my next marathon (in January!). There is just so much energy and inspiration and good vibes in the air that you can’t help but start thinking about the next time you want to do something huge like this. I think it’s a runner thing, because I met a person who had over 100 marathons under her belt! That’s 26,200 miles in official runs, don’t even get me started on the training runs! I also learned that there is a ‘marathon in every state group’, I totally want to join since I am Enthusiastic About Travel and Enthusiastic About running! Thank you all so much for reading this super long post. I hope this list inspires you to go out and set a physical goal. Stay tuned for a future post talking a little bit more about my running journey! To get more inspiration, check out my past posts about running and hiking here. Thank you all for reading, and stay enthusiastic! < Previous 6 Photos To Inspire You To Visit Cloud Gate AKA The Chicago Bean! Next > Enthusiastically Hiking Lower Calf Creek Falls!